This brand new design features two sets of leadpipes in both Bb and A with trumpet and cornet mouthpiece receivers. 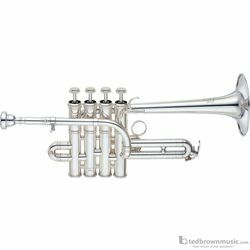 The YTR-9835 was developed with David Washburn of the Los Angeles Chamber Orchestra.The YTR-9835 comes with 4 leadpipes. Two leadpipes have trumpet mouthpiece receivers in Bb and A while the other two have cornet mouthpiece receivers in Bb and A. A one-piece bell has an axial (lengthwise) seam, making it a continuous extension of the instrument's material. This results in pure, uniform resonance and superior tone. A hammered yellow brass bell produces a perfectly-balanced tone with quick response and extra presence due to advanced manufacturing. Hand-lapping pistons and slides ensures an absolutely perfect fit and seal between the pistons and casing or slide parts. Such a perfect fit helps to achieve smooth air flow and smooth action and improve the response and intonation of the instrument. Perfectly rounded tubing results in less turbulence and a smoother air flow, thus allowing for an excellent scale and reduced resistance.